Critics of the current city administration wearing shirts saying they support a recall of the recently elected mayor and council members attend the Edinburg State of the City Address at the Edinburg Auditorium Thursday, April 19, 2018, in Edinburg. 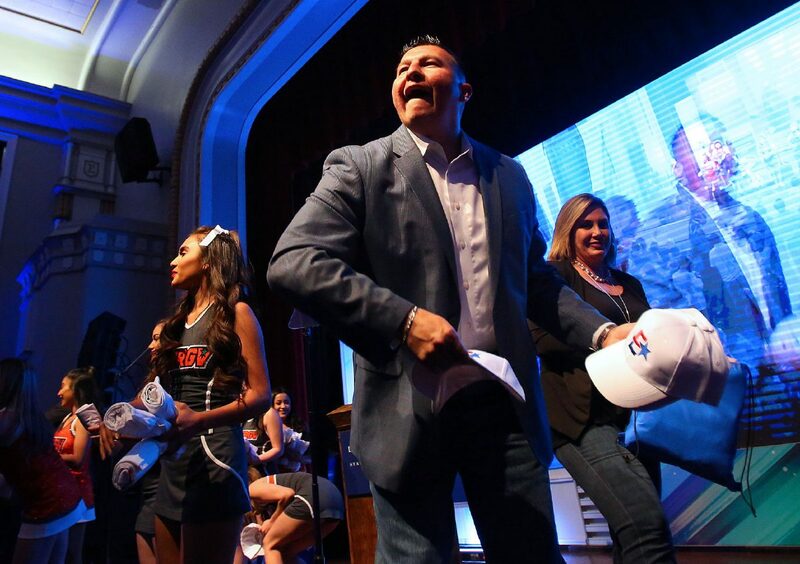 EDINBURG — The mayor here put on quite a show as he made his way into the Municipal Auditorium on Thursday night for his first State of the City address since his election last year. New Public Information Director Cary Zayas introduced Richard Molina after a round of mariachi music, the presentation of colors, Pledge of Allegiance, National Anthem and invocation. “Ladies and gentleman, standing at 6 feet tall, with a perfect election record of 4 and 0 — all wins by knockout — the former U.S soldier, former police officer, former police field training officer, former police corporal, former police sergeant, former Edinburg city council member, and our current mayor of the city of Edinburg, the honorable Richard Molina,” she said in the style of a boxing ring-announcer. 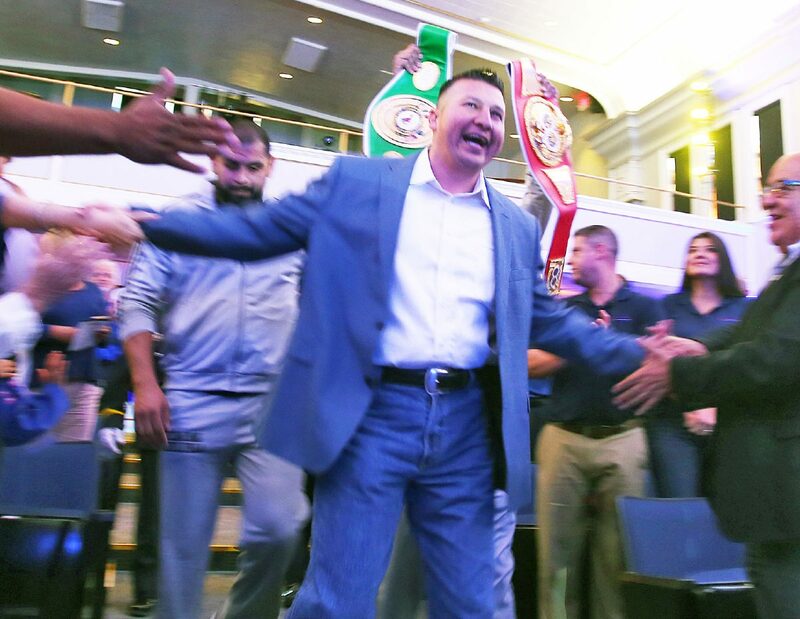 Molina strutted from the back of the auditorium to Flo Rida’s “Welcome to My House,” while a title belt was carried behind him by Valley professional boxer Eric Molina. About a dozen cheerleaders surrounded the mayor as he high-fived his way to the front of the stage, where he spoke for about 20 minutes before a pre-produced video presentation about the city began. 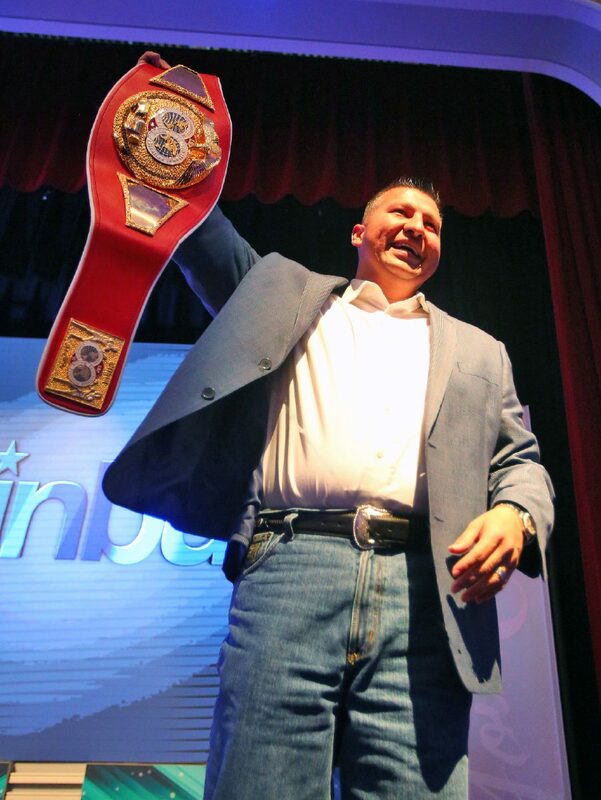 Edinburg Mayor Richard Molina holds a title belt above his head as he poses after the Edinburg State of the City Address at the Edinburg Auditorium Thursday, April 19, 2018, in Edinburg. 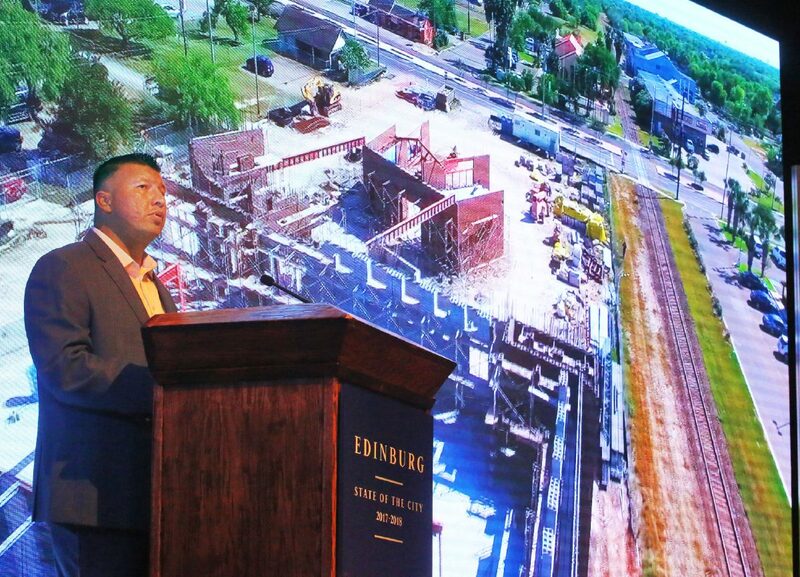 Edinburg Mayor Richard Molina delivers his address with an image of the Valley Metro Terminal under construction behind him during the Edinburg State of the City Address at the Edinburg Auditorium Thursday, April 19, 2018, in Edinburg. Mayor Richard Molina throws hats to the crowd after delivering the Edinburg State of the City Address at the Edinburg Auditorium Thursday, April 19, 2018, in Edinburg. 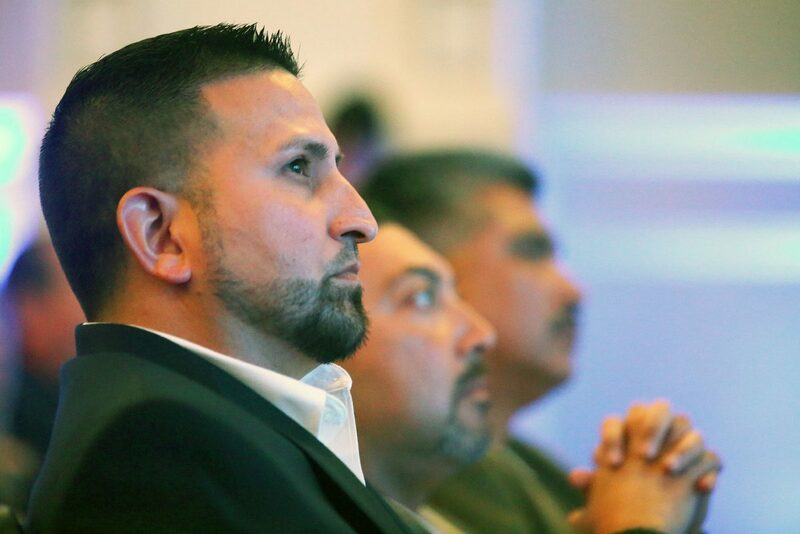 Edinburg City Council Member Jorge Salinas along with other council members listen to the Edinburg State of the City Address at the Edinburg Auditorium Thursday, April 19, 2018, in Edinburg. 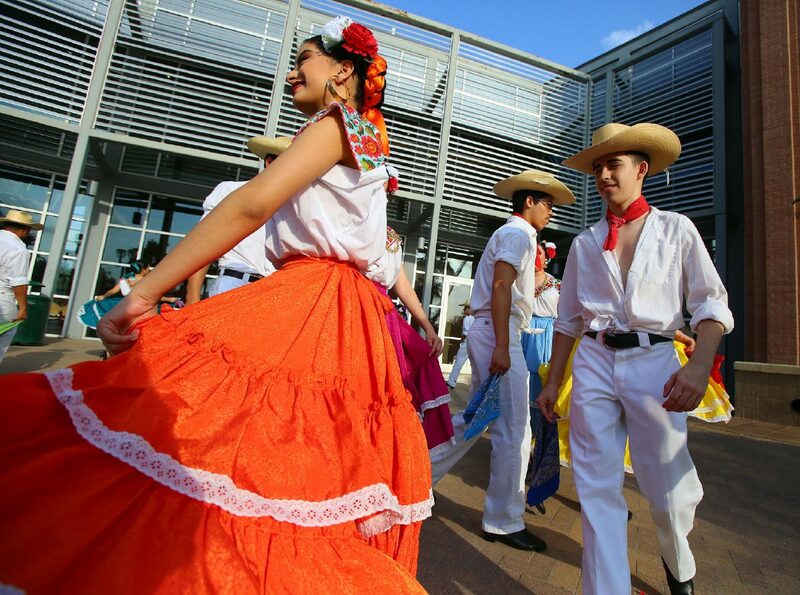 Grupo Folklórico Jaguar from Economedes High School practice in the Edinburg City Hall Courtyard before the Edinburg State of the City Address at the Edinburg Auditorium Thursday, April 19, 2018, in Edinburg. Edinburg Mayor Richard Molina is congratulated as he is introduced during the Edinburg State of the City Address at the Edinburg Municipal Auditorium Thursday, April 19, 2018, in Edinburg. The auditorium was filled with both ardent supporters and detractors of the new administration. 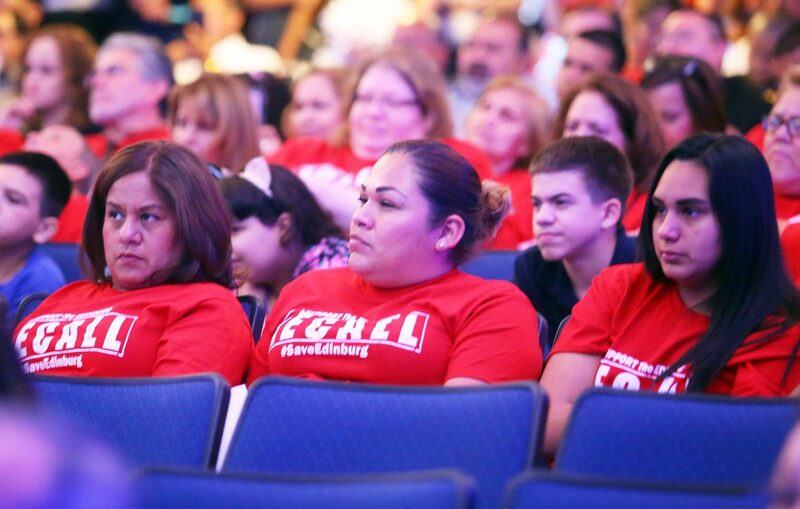 A group of about 50 people donned red shirts that read “I support the recall” and “#SaveEdinburg.” They sat together in the far left corner of the auditorium, while the most vocal supporters of the council sat in the front right corner. They clashed throughout the speech, which touted everything from a new resource center to a new city logo to road and drainage improvements. Molina began his address by highlighting the city’s recent investment into public safety. Council members spent more than $1.26 million earlier this month on 20 new police SUVs and a fire truck. That figure, however, doesn’t include two additional fire trucks the city also plans to acquire. “Never before has the city invested in our fire department on a scale like this,” Molina said. The expenditure drew criticism from former Justice of the Peace Mary Alice Palacios, who donned a red shirt at the event. He then teased his critics a bit when he thanked the former mayor — Joe Ochoa, who left office almost a decade ago in 2009. In the five months since he took office, city staff have cleared more than 20 miles of ditches and 35 miles of storm drains to help alleviate flooding, Molina said. Solid Waste crews also picked up more than 92 tons of debris during a clean-up event at the La Hielera neighborhood in north Edinburg. He proceeded to list new businesses and indicated the city had closed out 2017 with more than $271 million worth of construction permits, adding an additional 900 new apartments and 469 homes to the city. He also touted the streamlining of services with the relocation of the Edinburg Economic Development Corporation to city hall, and announced the vacated building would be turned into a resource center, giving residents access to computers and workforce-related support. The city currently has a 4.9 percent unemployment rate. “Edinburg is tied with our sister city of McAllen for having the most number of employed residents,” Molina said. At one point, the mayor touted projects that have previously drawn criticism from the council, most notably the Bert Ogden Arena, which was one of the first attractions displayed across the video screen promoting Edinburg. The arena is expected to generate a $45 million output and create 460 jobs, not including the employment generated by its construction. “It’s going to be the biggest and best venue in South Texas,” Molina said, drawing criticism from his detractors. The address also touched on some of the ongoing projects, like the construction of the Eisenhower Memorial Park and a new pediatric clinic run by the University of Texas Rio Grande Valley School of Medicine. “We have a strong city council that represents the very best of what we can accomplish when we work together,” Molina said. At that point, the group of red shirts got up and exited the auditorium.